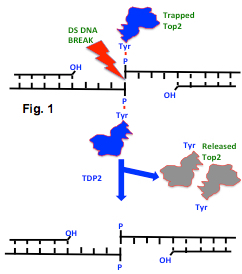 Tyrosyl-DNA phosphodiesterase-2 (TDP2) functions to remove trapped topoisomerase II/DNA complexes by processing 5′- blocking protein (topo II) at the site of the DNA break (Fig 1). In terms of physiological relevance, there appear to be multiple roles for TDP2, well beyond the repair of type II topoisomerase damage and subsequent DNA repair. This is quite different from the Top1/DNA repair protein, TDP1. There are a number of mechanistic differences between TDP1 and 2 as well (see reviews from Pommier, PMID 24856239 and http://www.uniprot.org/uniprot/O95551). In humans, TDP2 should be considered a multi-functional enzyme with roles in TNF and MAPK/JNK/p38 pathways. There is some similarity with APE1 and the superfamily of Mg++/Mn++ dependent phosphodiesterases and there is evidence that picorna viruses pirate TDP2 as a VPg un-linkase function. Given the key role for topo II in anticancer therapy, drugs that inhibit TDP2 might prove useful in combination therapy with established Interfacial Poisons (IFP) such as doxorubicin and etoposide (VP16). Indeed, when the Tdp2 gene is suppressed, cells show enhanced sensitivity to Top2 drugs, making Tdp2 an important anti-cancer target. Human TDP-2 is shipped on wet ice and should be stored at -20°C.